But there’s a lot that actually goes into sharpening your knife properly. For example, different types of blade steels and different types of blade grinds require different grits and different honing angles. You also need to be aware of what type of sharpener you are using for the knife you own. Bushcraft or field knives will more than likely be sharpened by a pocket sharpener as you will have them out in the field. It’s also important to have the proper whetstone for the job. Finding the right whetstone can be complicated, yet it’s an integral part of the knife sharpening process requiring a more detailed explanation. If you do not yet understand the difference between a Flat Grind and a Saber Grind, a water stone and an oil stone, an India Stone and an Arkansas Stone, then read on and everything you need to know about how to sharpen your knife will be explained in detail. Before we examine the actual process of honing a knife blade’s edge, let’s first examine the nature of whetstones. For example, whetstones are divided into different groups consisting of naturally occurring stones such as Japanese Water Stones and Arkansas Oil Stones and man made stones such as Crystalon (aluminum oxide) and India Stones (silicon carbide). Also, both natural and manmade whetstones are classified as either water stones or oil stones which means that they are meant to be used with either water or oil as a lubricant. In addition, there are additional types of man made whetstones such as diamond hones and ceramic hones that can be used either with or without water to lubricate them. Plus, both natural and man made whetstones are available in different grits with the more coarse grits being more abrasive and the finer grits being less abrasive. The primary reason that it is important to know and understand all of that is because different knives with different types of blade grinds need to be sharpened at different angles in order to achieve the proper type of edge. So, let’s start with a description of blade grinds but, in order to do that, we first need to define some terminology. In the case of a Saber Grind or a Hollow grind, the line located on the side of the blade above the cutting edge that extends from the back of the blade to the tip. This is then created by the removal of metal from the face of the bar stock is called the Primary Bevel Line and the line that descends from the back of the Primary Bevel Line to the back of the Cutting Edge is called the Plunge Line. 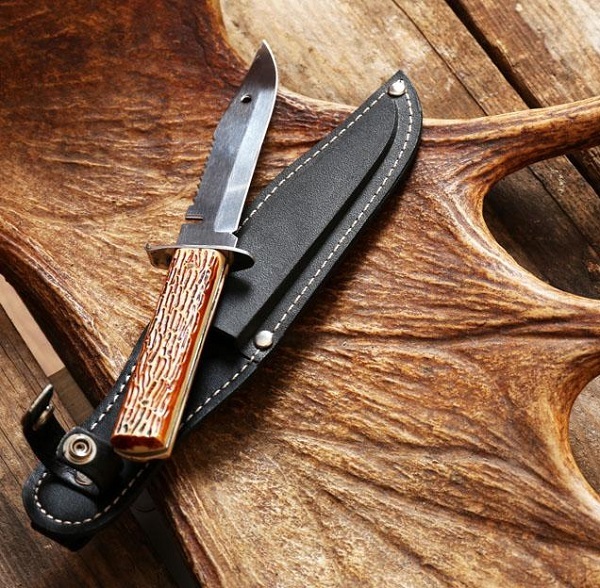 Also, the widest cross section of any knife blade is called the Spine. Therefore, a Saber Grind is a blade grind who’s Primary Bevel Line is located low on the face of the blade, close to the Cutting Edge, with either flat or slightly concave Primary Bevels so that it creates a relatively thick Primary Bevel. With a Flat Grind, there is no Primary Bevel Line because the face of the blade is ground flat from the Cutting Edge to the Spine which creates an edge that is sharper than a Saber Grind and tougher than a Hollow Grind. Consequently, knives meant for heavy-duty use generally have Saber Grinds whereas, knives meant for general purpose use generally have Flat Grind and, knives meant for hunting generally have Hollow Grinds. Therefore, blades with Saber Grinds require sharpening at much higher edge bevel angles (25 to 30 degrees) than blades with Flat Grinds or Hollow Grinds. This is important so that they can withstand the shock generated when the knife is used to chop and, by the same token, blades with Hollow Grinds will need to be sharpened at much lower edge bevel angles (10 to 15 degrees). In addition, different blade steels and Rockwell Hardness’s will require different grits and sometimes even different whetstone materials to sharpen them. 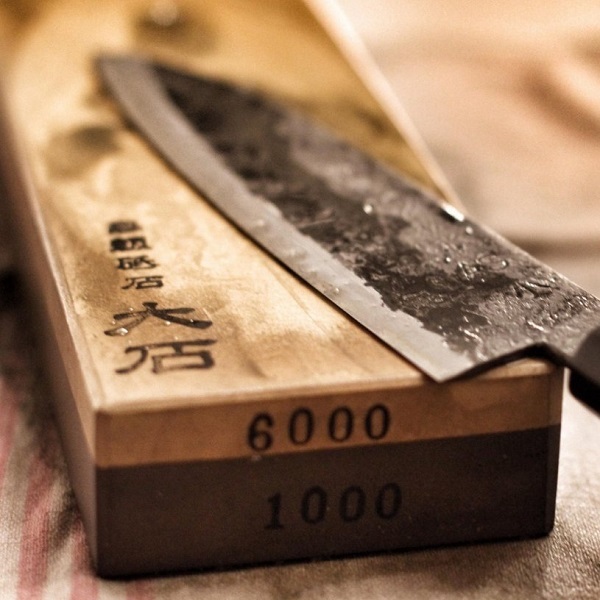 For instance, knives with relatively soft blades such as 1095 or SK-5 ranging from 50-55 RHC are generally used for large, heavy, blades with Saber Grinds and thus, although they sharpen relatively quickly, they also tend to incur the greatest amount of damage to their edges and thus, they often need the highest degree of repair most often. Therefore, when sharpening a knife with a Saber Grind made from a softer blade steel, start with a coarse grit and progress to a finer grit. But, leave the edge rough because it will dull quickly the next time you use it. On the other hand, for knives with relatively hard blades such as 154-CM, ATS-34, or D2 around 58-63 HRC with either Flat or Hollow Grinds, start with a medium grit and progress to a fine grit. Then, if the blade has a Hollow Grind with a particularly thin Primary Bevel, then you might want to polish the cutting edge with an extra-fine grit. For those of you who are not familiar with either of these types of whetstones, Japanese Water Stones are mined in the mountains of Japan. They are made from from ancient deposits of metamorphic stone that consists of tiny silicate particles suspended in a clay matrix. As a result, the fine crystals they produce when sharpening a knife blade tend to remove the steel very quickly while also polishing the surface. Arkansas Oil Stones on the other hand are mined in the mountain of Arkansas. They come from ancient deposits of Novaculite which is thought to be a metamorphic sandstone. Novaculite also produces fine crystals when use to sharpen a knife blade and, it too, has the property of removing steel relatively quickly while also polishing the surface. Then, there are man made whetstones made from powdered, industrial grade, diamonds as well as from silicon carbide impregnated ceramic which do not require any sort of lubrication. But, regardless of which type of whetstone you choose, the process of sharpening a knife blade is the same. For instance, depending on the type of whetstone you are using, you may first need to lubricate it either with water or honing oil. Then, you start by grasping the knife by the handle and placing the edge against the whetstone at a 10 degree to 30 degree angle depending on the thickness of the Primary Bevel and then, slowly move the entire length of the cutting edge across the whetstone while maintaining the same angle. Then, you turn the blade over onto its opposite side and perform the same action for that side. Then, you continue to perform this action, alternating from side to side, until the edge reaches the desired sharpness. However, if you are one of the many people who has difficulty maintaining a consistent angle during honing, then there are several different types of honing aids on the market that will enable you to hone a fine edge on any type of knife blade. Thus, as you can see, the process of sharpening a knife blade actually starts with choosing the correct type of whetstone in the proper grit based upon the type of steel the knife’s blade is made from and it’s Rockwell Hardness. In addition, the correct honing angle is determined by the relative thickness of the of the Secondary Bevel which is, in turn, governed by the type of blade grind. Last, as a general rule, manmade whetstones such as Crystalon and India Stones are the cheapest and work well for cutting initial, secondary, bevels or quickly repairing damaged edges whereas, natural whetstones such as Japanese Water Stones and Arkansas Oil Stones are more expensive but, do a better job of creating, extremely sharp edges. On the other hand, both diamond hones and ceramic whetstones are useful at times when it inconvenient to have to lubricate the whet stone prior to use. But, regardless of which type of whet stone you choose, the real key to achieving a super sharp cutting edge is to maintain a consistent edge bevel angle throughout the entire sharpening process. Blades with Flat Grinds will need to be sharpened at angles between the two depending of the thickness of the blade’s Spine.